LaLiga North America launches #BringUSTheGame campaign! Home / International Football / Americas / LaLiga North America launches #BringUSTheGame campaign! LaLiga North America and soccer fans across the country joined to launch the #BringUSTheGame campaign. This national grassroots campaign will highlight the growing popularity of soccer in America and the desire from American fans to bring the greatest soccer league in the world to the US to play the first ever European club regular season match held outside of Europe. #BringUSTheGame launches with a petition rallying American soccer fans to say they want their chance to see some of the best players in the world, including Luis Suárez, Philippe Coutinho, Cristhian Stuani, Portu, and others, competing at the highest level on US soil. The scheduled match between LaLiga champions FC Barcelona and Girona FC will take place at Hard Rock Stadium on January 26 in Miami, Florida. Over the past two decades soccer has continued to rise in popularity in the United States. A recent report in Forbes suggests that soccer has the potential to become America’s third most popular sport – passing “America’s National Pastime” of baseball. That sentiment has translated to continued growth in attendance at MLS games across the country. US soccer fans are also devoted fans of LaLiga. When Real Madrid played FC Barcelona as part of the International Champions Cup in Miami last year, over 1.7 million viewers tuned in on ESPN. “All of America’s top sports leagues – The NBA, The NFL, and MLB – have played regular season games all over the world to reach international fans and have great success popularizing these sports globally. We firmly believe this will have the same impact in increasing the popularity of soccer here in the US, with more kids playing and more fans watching. We hope all of our partners in the soccer community recognize and support the positive impact of bringing the highest-level soccer to the US will have on turning more people on to the sport,” said Stephen Ross, chairman and owner of Relevent. So far, fans and soccer players across the country have come together to make their voices heard, and help bring high level soccer to the United States. 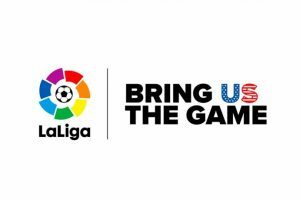 To sign the #BringUSTheGame pledge to support bringing LaLiga soccer match to America visit: www.bringusthegame.com . Previous Outstanding national association projects saluted at UEFA GROW Awards! Next Mohammedan Sporting beat TRAU to too group in Bordoloi Trophy!